What was your favorite baon growing up? I was super skinny as a kid and my grandma made it her life’s goal to help me reach the ideal weight as a kid. The thing is, my grandma was a health nut. She was the type who would purchase tons of Ernie Baron’s Triangles. Do you remember those - the ones you put over your water to make it better? I still have no idea what it actually did. It was just hilarious living in a house full of aluminum triangles. Our pantry was filled with nothing but Baron Triangles, Malunggay, Wheat Germ, and other kinds of healthy food. There was no room for junk food. The only thing we had that could probably help me put on some weight, in my grandma’s eyes at least, was Star Margarine. So every day, my food was slathered with Star. My favorite? Toasted bread + Star Margarine + Brown Sugar. I didn’t mind having it for recess everyday. And I would always come running towards the house and even leave my bike outside just to get a taste of my favorite snack. Knowing how much I love having this for snack, they probably would have fed me the same food over and over again. It would take me 2 hours to finish dinner. Crazy as it sounds but I would always be left alone with my yaya in the dining room while the rest of my family would be up in their rooms already. TWO. FULL. HOURS. It would take me that long to finish my meal unless it’s Star Fried Rice with scrambled eggs sautéed in Star Margarine with salt and fresh pepper. That was my second favorite meal. When I got older and learned how to cook myself, I would always prefer to have my eggs cooked using Star Margarine garlic flavor. OH-MY-GOD. I’m already drooling just thinking about it. To be honest, I would rather have that (especially when topped with cold rice) over an expensive dinner at a posh restaurant any day. As it turns out, margarine is actually healthy. And that perhaps would be the reason why my grandma would buy it instead of butter. That’s when I also realized that being healthy is about having “katawang sapat, hindi payat”. 1) It lowers your cholesterol. A study conducted in the United States reported that 46 families attested that swapping butter with margarine successfully lowered their blood cholesterol levels. With only 70% fat—some even lower with only 50% fat when spread lightly—margarine is the leaner option as compared to butter which boasts 80% fat. 2) It can block cholesterol absorption. Since margarine is made from vegetable oil, it contains little or even no trace of cholesterol. According to Medical News Today, margarine not only lowers cholesterol but it can even block its absorption—so families with a history of heart disease and high cholesterol should use margarine at home. 3) It lowers the risk of coronary heart disease. Researchers at the Harvard TH Chan School of Public Health published the results of a 30-year-study of thousands of people’s diets. Their breakthrough discovery? Those who remained healthy over the long period were those who replaced even just five percent of their saturated fat with polyunsaturated fat or monounsaturated fat. The result? As much as 25% lower risk of coronary heart disease. Good news, margarine is a great substitute for butter! 4) It lowers your fat intake. Not only does margarine NOT add inches to your waistline, but it also scientifically lowers your fat intake. Switching from butter to soft spread margarine helps reduce the intake of solid fats, as margarine only contains healthy unsaturated fats found in vegetable oil. So now that I’m a mom, I try to follow my Lola’s footsteps in keeping my family healthy. 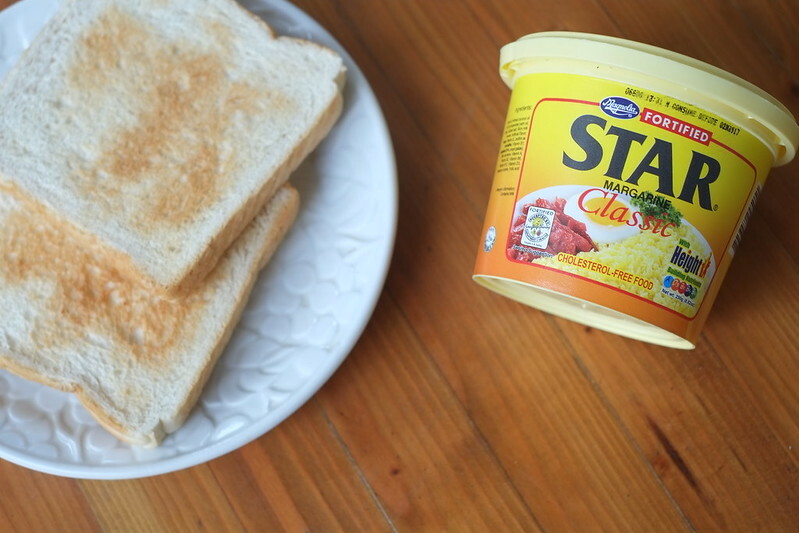 I make sure that we have a balanced diet without compromising the taste by adding flavor using Star Margarine! In fact, my daughter likes it better than ice cream. Did you have STAR with everything as a kid too? Let’s travel back in time by sharing your #ThrowbackThursday photos.